They press up against the stage, the young ones, their faces bathed in delight or clenched in crumpled ecstatic agony. They lean over the edge of the platform, clutching gifts and beads or notes or the group’s latest album. And some reach, reach out, squirm on their bellies trying to get up over the edge of the state, just maybe to-touch-one-of-them . . . once. . . .
Often they work in pairs, sometimes in gangs. . . . They’ll cooperate with each other to outfox whatever stands between them and the rock and roll boys—but only to a point. That is, they’ll gang a door to get inside, but once it’s broken in, it’s every girl for herself. . . . Since so many of the groupies were underage, Sander used pseudonyms for two of the girls profiled in her article, but in an accompanying caption the editors noted that “the girls want not only their correct names published but also their photo, because of the increasing imposter problem.” The editors agreed to print the grainy Polaroid but identified the girls only by their real first names. Sander’s gritty pieces on Sixties subcultures soon caught the attention of national editors, and she began to get commissions from national publications. For her first assignment for Life Magazine, Sander agreed to go on the road with a rock band and report on the grueling demands and tawdry hijinks of the concert tour, including the coterie of girls and young women who pursued band members. According to Mick Wall in When Giants Walked the Earth, Sander had hoped to cover The Who, but that didn’t pan out and she was instead invited to join the still-up-and-coming Led Zeppelin for the last two weeks of their second American tour in May 1969. 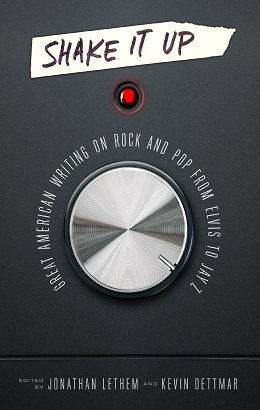 Sander’s piece on her two weeks with Led Zeppelin has been reprinted in the just-published anthology Shake It Up: Great American Writing on Rock and Pop from Elvis to Jay Z. A brief headnote by Jonathan Lethem and Kevin Dettmar offers additional biographical information about the author. Some years later, a group called Led Zeppelin came to America to make it, taking a highly calculated risk. . . . If you don't see the full selection below, click here (PDF) or click here (Google Docs) to read it—free!